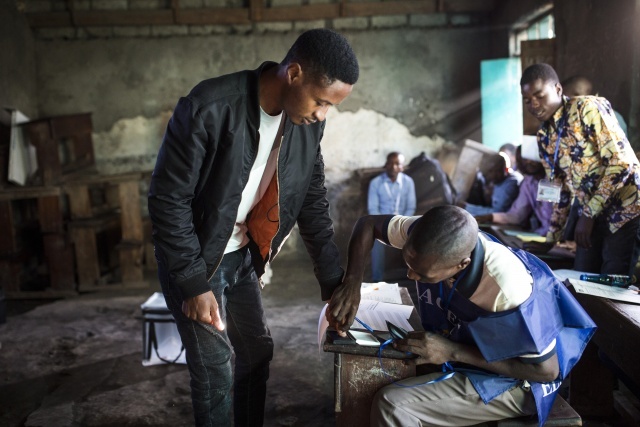 (AFP) - Voters in the Democratic Republic of Congo went to the polls on Sunday in elections that will shape the future of their vast, troubled country, amid fears that violence could overshadow the ballot. Millions of electors are choosing a successor to President Joseph Kabila, who is stepping down two years after his term limit expired -- a delay that sparked bloody clashes and revived traumatic memories of past turmoil. The election's credibility has already been strained by repeated delays, the risk of hitches on polling day and accusations that electronic voting machines will produce a rigged result. The announcement came after the pair had met with the Independent National Election Commission (CENI) as well as Kabila's preferred successor, Emmanuel Ramazani Shadary. The UN, the United States and Europe have loudly appealed for the elections to be free, fair and peaceful -- a call echoed on Wednesday by the presidents of Angola, Botswana, Namibia, Zambia and the neighbouring Republic of Congo. "I'm excited to vote, to be able to choose at last," one 18-year-old student named Rachel told AFP. If the elections are "free and fair," an opposition candidate will almost certainly win, according to Jason Stearns of the Congo Research Group, based at the Center on International Cooperation at New York University. However, "the potential for violence is extremely high," Stearns warned. And between 43 percent and 53 percent said they did not trust DRC's courts to settle any election dispute fairly. However, Kabila said he was confident "everything will go well on Sunday". "I want to reassure our people that measures have been taken with the government to guarantee the safety of all sides, candidates, voters and observers alike," he said in his end-of-year address broadcast Saturday. The legacy of that era endures today in the DRC's eastern border region, where ruthless militias have carried out hundreds of killings. Kabila said the vote would take place "as soon as the situation allows it". Provisional results are due on January 6.